Palmer are perhaps best known for their speaker simulator/load boxes, which have been (and are) used by a legion of guitarists. The Palmer range expanded relatively recently to include floor-based pedals and switchers, and in 2010 the first Palmer valve amplifier, the high-gain Fat50, quietly appeared, followed this year by a range of guitar loudspeaker cabinets. With the release of the Palmer Drei triple single-ended, Class-A amplifier, designed by Palmer's own Markus Torvinen, this steady advance is about to hit the limelight, because this amp is in a class of its own — quite literally. The Drei's styling harks back to an earlier era, when valves ruled the earth and white-coated engineers built amplifiers that were designed to last forever, their forms faithfully following function without input from marketing men and styling gurus. The Drei's grey-painted chassis features a sloping control panel and is enclosed in a black metal cabinet. There's a definite echo of 1950s valve radio in its overall styling! Get a bit closer and you'll see that the white silk-screened panel legends are in the German language, which is a really nice touch that reinforces the 'old valve radio' vibe, echoing the Grundig, Blaupunkt, Braun and Siemens radios of yore. The front-panel layout also lets you know that this is no ordinary amplifier. The single Eingang (Input) jack is followed by the gain controls for the Normal and Höhen (Bright) parallel preamp channels. The Klang (Tone) control comes next, followed by the volume controls for the three separate, parallel Endstufen (Power Amplifiers) — Eins, Zwei und Drei. 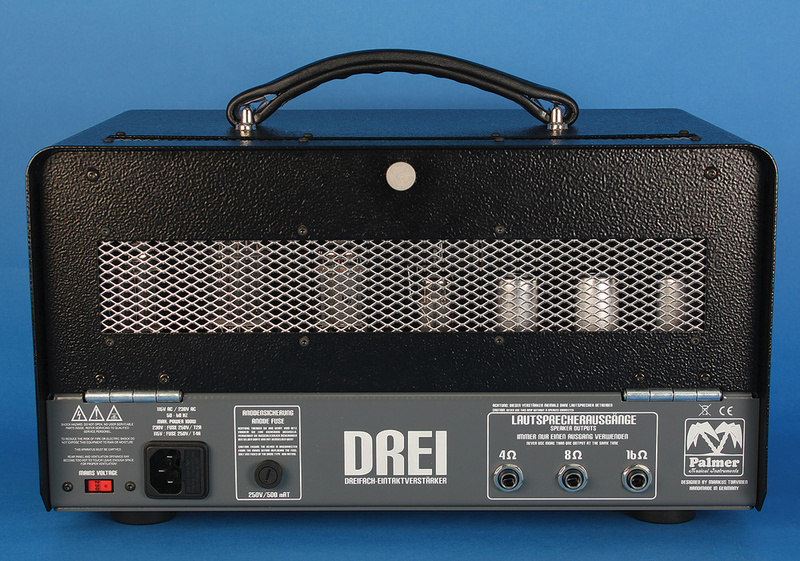 Like all good valve amps, the Drei is weighty for its size, with massive mains and output transformers, together with a hefty anode choke, dominating the top of the chassis. Behind this row of iron sits the complement of valves: three 12AX7 preamp valves; three output valves — EL84, 6V6 and 6L6; and, finally, the GZ34 rectifier valve. 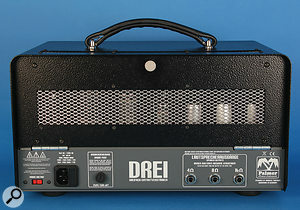 The Drei's three output valves are configured as separate, but parallel, single-ended, Class-A power amplifiers — EL84 (Eins), 6V6 (Zwei) and 6L6 (Drei). A single-ended power amplifier consists simply of a valve and an output transformer. However, the presence of an anode choke indicates the use of a parafeed output stage, giving a better bass response than the 'pure' single-ended configuration and obviating saturation of the output transformer — useful when you realise that the Drei packs three primary output windings in its single housing. Seeing a GZ34 rectifier valve sitting there was a pleasant surprise to me, as many modern valve amplifiers use solid-state rectifiers, and, indeed, the Drei can be retrofitted with one of those if you want a bit more power than is on offer from the stock setup. I'm a big fan of valve rectifiers, as I love the sag and compression produced by the output valves when the power supply is pushed to its limits. There is a video on the Palmer web site (www.palmer-germany.com/192-1-drei.html) in which Drei designer Markus Torvinen talks at length about his creation. Personally, I'm a Luddite who prefers that valve amplifiers be of point-to-point construction, but when a designer states that he has built a hand-wired version of the Drei and that he cannot tell the difference between that and the PCB-based production version, I'm certainly going to be willing to be convinced. What also caught my attention was that there are only five passive components in the amplifier's signal path — a testament to the purity of Torvinen's design vision. From the back of the Drei, you can see a profusion of shielded tubes, and dedicated outputs for three different speaker impedances. Before getting down to actually playing the Drei, I connected it to a THD 2x12 cabinet and left it running for 24 hours to burn in. Single-ended, Class-A valve output stages are imbued by the hi-fi world with myth and magic, but in guitar amplifiers (especially when coupled with valve rectification) they make for highly responsive, touch-sensitive amplifiers. Add in a warm, coherent sound that has a natural, unforced distortion when you want it, and it's no surprise that this type of amplifier has enjoyed enduring popularity. The one drawback of single-ended amplifiers is their low output, which has confined them to practice/recording combos such as the Vox AC4TV (which uses an EL84 tube), Fender's Champ (6V6) and the Cornell Romany (6L6). If you can imagine a setup that ran these three amps together, then you'll get an idea of the kind of sounds that the Drei can give you. Incidentally, although it isn't mentioned in the tasty leather-bound manual (which is personally signed by Markus Torvinen), the Palmer catalogue reveals that you can swap out the 6L6 for an EL34 to lead you into Marshall territory. Playing the Drei is a real pleasure. Running either input section with each power-amp in turn gives you the sounds you'd expect — the chimey, harmonic-laden flavour of the Eins, the somewhat darker sound and smoother overdrive of the Zwei, and the bigger, darker version of the Zwei with a tighter bass and more attack that is the Drei. Start mixing these three sections together in combination with varying proportions of gain from the Normal and Höhen preamp channels (and, of course, your guitar's volume control) and you'll find yourself spending many happy hours getting precisely the sound you're looking for. Keeping a notebook handy to jot down the settings for the best of these combinations quickly becomes a very good idea since, quite frankly, I struggled to make a sound that I didn't like. It's been quite a while since I played through a brand-new amplifier that gave me so much pleasure. Other than the fact that the tone control doesn't actually do that much once it gets above halfway, there isn't anything that I could find to fault on the Palmer Drei. Some may point to the fact that the Drei doesn't have an effects loop or a DI out, but I couldn't care less — I'll happily give those up in exchange for the pleasure of playing through this amp. 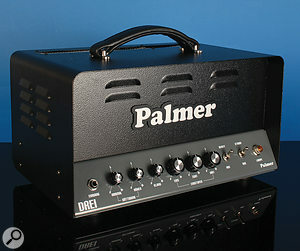 The Palmer Drei is one of those rare amps that are easy to use, sound great and that inspire you to play. Tone hounds are going to love this little head, and I'd like to hear it with a full complement of vintage NOS tubes fitted. The Drei is also, in my opinion, superb value for money. Even factoring in the cost of a speaker cabinet, there's nothing that I can think of that approaches the Drei in terms of sound for your pound. 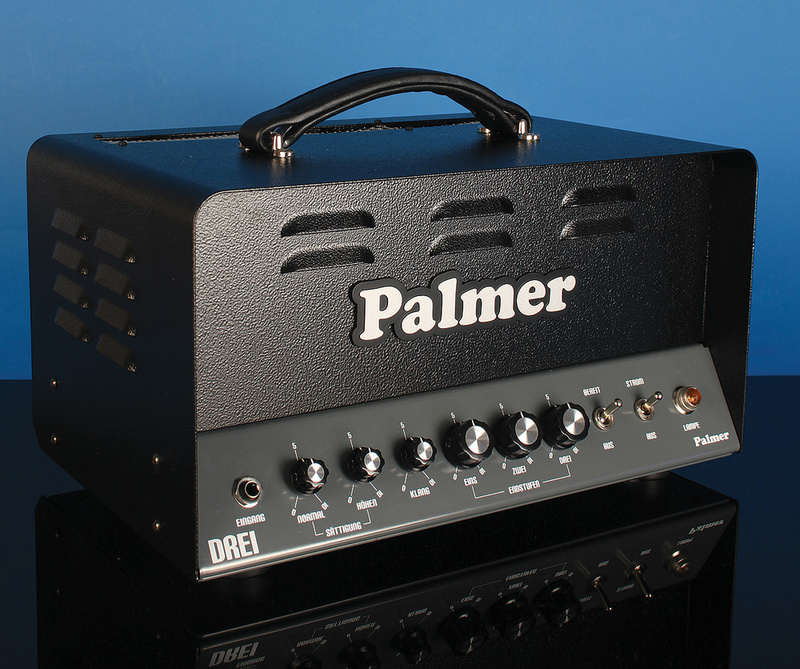 If you're looking to buy a recording or small gig amplifier, then, I recommend that you put the Palmer Drei at the top of your audition list. It is simply superb. There are two off-the-shelf alternatives to the Drei that I could find. However, neither of these amplifiers does exactly what the Drei does. The first is the THD Bivalve. With the facility to run using any two octal-based output valves simultaneously, with a wide range of preamp valves, this little amplifier lets you mix and match valves to your heart's content until you find 'that' sound. Like the Drei, the Bivalve also has a separate transformer winding for each valve, but you can't vary the balance between them. Sadly, availability of the Bivalve is currently at an all-time low, and you'll have to hunt around a fair bit to find one. Another possible alternative to the Drei is the Mesa Boogie Transatlantic TA15, which has a setting giving five watts from an EL84 running in Class-A mode. The Transatlantic isn't exactly comparable to the Drei, but its voicing options and twin-channel preamp give you access to a wide range of possible sounds. All valve construction — including the rectifier. The absence of a direct out and effect loop. Adam Hall +44 (0) 1702 613922.